Deheubarth (Welsh pronunciation: [dɛˈhəɨbarθ]; lit. 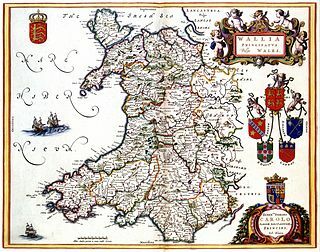 "Right-hand Part", thus "the South") was a regional name for the realms of south Wales, particularly as opposed to Gwynedd (Latin: Venedotia). It is now used as a shorthand for the various realms united under the House of Dinefwr, but that Deheubarth itself was not considered a proper kingdom on the model of Gwynedd, Powys, or Dyfed is shown by its rendering in Latin as dextralis pars or as Britonnes dexterales ("the Southern Britons") and not as a named land. In the oldest British writers, Deheubarth was used for all of modern Wales to distinguish it from Hen Ogledd (Y Gogledd), the northern lands whence Cunedda and the Cymry originated. Cantrefi of Deheubarth, c. 1160. Deheubarth was united around 920 by Hywel Dda out of the territories of Seisyllwg and Dyfed, which had come into his possession. Later on, the Kingdom of Brycheiniog was also added. Caerleon was previously the principal court of the area, but Hywel's dynasty fortified and built up a new base at Dinefwr, near Llandeilo, giving them their name. After the high-water mark set by Hywel, Dinefwr was repeatedly overrun. First, by the Welsh of the north and east: by Llywelyn ap Seisyll of Gwynedd in 1018; by Rhydderch ab Iestyn of Morgannwg in 1023; by Gruffydd ap Llywelyn of Gwynedd in 1041 and 1043. In 1075, Rhys ab Owain and the noblemen of Ystrad Tywi succeeded in treacherously killing their English-backed overlord Bleddyn ap Cynfyn. Although Rhys was quickly overrun by Gwynedd and Gwent, his cousin Rhys ap Tewdwr – through his marriage into Bleddyn's family and through battle – reëstablished his dynasty's hegemony over south Wales just in time for the second wave of conquest: a prolonged Norman invasion under the Marcher Lords. In 1093, Rhys was killed in unknown circumstances while resisting their expansion into Brycheiniog and his son Gruffydd was briefly thrown into exile. Following the death of Henry I, in 1136 Gruffydd formed an alliance with Gwynedd for the purpose of a revolt against Norman incursions. He took part in Owain Gwynedd and Cadwaladr ap Gruffydd's victory over the English at Crug Mawr. The newly liberated region of Ceredigion, though, was not returned to his family but annexed by Owain. The long and capable rule of Gruffydd's son the Lord Rhys – and the civil wars that followed Owain's death in Gwynedd – briefly permitted the South to reassert the hegemony Hywel Dda had enjoyed two centuries before. On his death in 1197, though, Rhys redivided his kingdom among his several sons and none of them ever again rivalled his power. By the time Llywelyn the Great won the wars in Gwynedd, in the late 12th century, lords in Deheubarth merely appear among his clients. Following the conquest of Wales by Edward I, the South was divided into the historic counties of Cardiganshire, Carmarthenshire and Pembrokeshire by the Statute of Rhuddlan. In the arena of the church, Sulien was the leader of the monastic community at Llanbadarn Fawr in Ceredigion. Born ca. 1030, he became Bishop of St David's in 1073 and again in 1079/80. Both of his sons followed him into the service of the church. At this time the prohibition against the marriage of clerics was not yet established. His sons produced a number of manuscripts and original Latin and vernacular poems. They were very active in the ecclesiastical and political life of Deheubarth. One son, Rhygyfarch (Latin: Ricemarchus) of Llanbadarn Fawr, wrote the Life of Saint David and another, Ieuan, was a skillful scribe and illuminator. He copied some the works of Augustine of Hippo and may have written the Life of St. Padarn. ^ Jenkins, John. Poetry of Wales Archived 2008-06-07 at the Wayback Machine. Houlston & Sons (London), 1873. Accessed 1 Feb 2013. ^ The orientation of Medieval maps and geographical thinking was towards the east. Facing east, north was thus on the "left-hand" side and south on the right. ^ Ellis, Thos. P. Welsh Tribal Law & Custom in the Middle Ages, Vol. I, iii, §3. 1926. Accessed 1 February 2013. ^ Wade-Evans, Arthur. Welsh Medieval Laws. Oxford Uni., 1909. Accessed 31 January 2013. ^ Williams, Jane. A History of Wales. Cambridge University Press, 2010. Accessed 1 February 2013. Aberystwyth Castle is a Grade I listed Edwardian fortress located in Aberystwyth, Ceredigion, Mid Wales. It was built in response to the First Welsh War in the late 13th century, replacing an earlier fortress located a mile to the south. During a national uprising by Owain Glyndŵr, the Welsh captured the castle in 1404, but it was recaptured by the English four years later. In 1637 it became a Royal mint by Charles I, and produced silver shillings. The castle was slighted by Oliver Cromwell in 1649. Maredudd ab Owain was a 10th-century king in Wales of the High Middle Ages. A member of the House of Dinefwr, his patrimony was the kingdom of Deheubarth comprising the southern realms of Dyfed, Ceredigion, and Brycheiniog. Upon the death of his father King Owain around AD 988, he also inherited the kingdoms of Gwynedd and Powys, which he had conquered for his father. He was counted among the Kings of the Britons by the Chronicle of the Princes. Brycheiniog was an independent kingdom in South Wales in the Early Middle Ages. It often acted as a buffer state between England to the east and the powerful south Welsh kingdom of Deheubarth to the west. It was conquered and pacified by the Normans between 1088 and 1095, though it remained Welsh in character. It was transformed into the Lordship of Brecknock and later formed the southern and larger part of the historic county of Brecknockshire. To its south was the Kingdom of Morgannwg.